Akinori Hosaka was born in Akita Ken in the province of Akita in the north of Japan’s main island on January 17th 1938. He started Judo in High School, and was naturally talented. He was many things to many people; teacher, coach, mentor, motivator, best man, father figure and friend. At aged 18 he won the Akita Ken Junior Open Championship and then attended the top Judo University of the time: Nihon University, studying law (a fellow student was George Kerr). His Judo regime at this time consisted of training six hours a day, 6 days a week with competitions on most Sundays. At 20 years old he was a finalist in the 2nd Dan Kodokan Student Championship and was later graded to 3rd Dan in a Kodokan Batsugun Contest, which is a "Winner stays on" line-up, where anyone who beats five or more of their own grade earns a grade promotion. He was very proud of his contest record. At 21 years old he was a finalist in the 3rd Dan Kodokan Student Championship and then at 22 years old fought Isao Inokuma for half an hour in the All Japan University Championships. At the end of the first ten minute round neither had managed to achieve a winning score and so the contest was extended for a further 10 minutes. At the end of which, the situation was still the same so they fought for a further ten minutes at the end of which the decision went to the judges who declared Isao Inokuma the winner (the year before Isao Inokuma had won the All Japan Open weight Championship and would 4 years later go on to take a Gold Medal at the Tokyo Olympics). The next chapter in his life is illustrated by the stamps in his passport. He was invited to teach judo in the northwest of England, on just a one year contract. 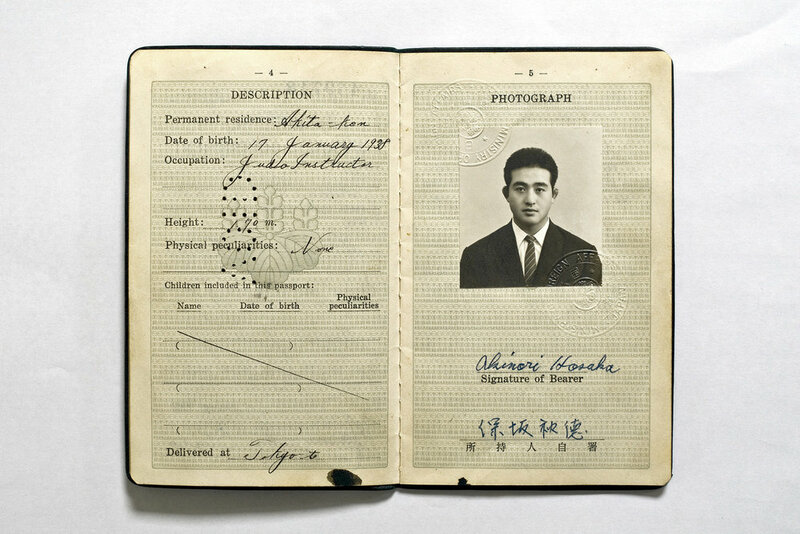 Travelling from Tokyo via Hong Kong he arrived in Manchester in September 1962 and had to sign the city Police alien’s register which only permitted him to work as a judo instructor. Shortly after his arrival, he met with the then British squad and fought and defeated each one, from lightest to heaviest in turn. At the start of each contest, he told his opponent which technique he would use to beat them and did so in every contest, only delaying to make sure there was room on the mat to throw safely. Hosaka remained in the UK for the rest of his life, continuing his work with the BJA and then developing coaches with his ‘fundamental principles of judo’ courses for the BJC. In his final days in hospital, a nurse said “Mr Hosaka, I need to fill out this form with a few of your details, please can you tell me your religion?” He replied “Judo." At his funeral a cast of former players unfolded themselves from their cars, hobbled to the crematorium to pay their respects and "thank a man who shaped their lives". Hosaka requested the song Tie a Yellow Ribbon to be played at his funeral, “…. I’ve done my time, I’m coming home….” . The book was born out of the regret that I did not take enough photographs of him.